The Aria delivers a silky smooth response with a touch of valve flavour thrown in for good measure. Smooth non-hyped sound. Very well made. The classic mic and cradle styling. Not ideal for quiet sources. Sontronics is a British success story. With roughly ten years on the clock it was an early adopter in the pro audio world of Chinese manufacture coupled with home-built design, and to this day it's still using the same manufacturer near Shanghai. The Aria is its latest large diaphragm cardioid valve condenser, and at £1,099 is aimed squarely at the pro or well funded project user. It replaces the Omega valve condenser, but is essentially a completely new design from the ground up, and in keeping with its 'task specific' approach it's slated primarily as a vocal mic. Of course, unless Sontronics has tailored the response very aggressively, we would hope to be able to use it on all sorts of sources including drum kit overheads, room mics, guitar amps and piano. The only things we'd be wary of are quiet sound sources and distant ambient uses, as valve mics tend to be noisier than their solid state counterparts. "Up close it looks and feels excellent, and the satin and chrome finish really gives it a retro look"
So, what's in the box? First up, the mic itself. Sontronics made its name with some quite individual physical designs, making them easy to spot. But the Aria follows more traditional styling, sitting somewhere between the Neumann U87 and Telefunken 251, with the former's sloping grille profile. Up close it looks and feels excellent, and the satin and chrome finish really gives it a retro look. The capsule is a newly developed 1.07-inch edge terminated single diaphragm design, and the onboard valve is an ECC83. It also comes with a traditional elastic suspension cradle and a regular clip. The Aria gets a new power supply incorporating a blue 'tube ready' LED. The PSU also includes the -10dB pad and 75Hz high pass filter, and connection to the mic is via 8-pin screw connectors and multicore. Finally, the PSU has a mains conditioner, which helps keep the power interference free. On the spec front, the Aria has a similar noise figure to the Omega (18dB A-weighted), but at 18 mV/Pa is slightly less sensitive. With everything plugged up, the first thing that's obvious with the Aria is just how natural it sounds. There's definitely a slight presence lift, but this is in the upper mids rather than right into sibilant territory. Beyond this there's no high frequency hyping, or the brittleness that plagues mics of that ilk. So, one's attention is drawn to the lows and low mids. These feel solid and although there is a small proximity effect, it's not at all overbearing. In use we feel the cardioid polar pattern is pretty broad both in horizontal and vertical directions. So the sweet spot is large, which is particularly useful for vocals and acoustic guitars. On vocals the Aria delivers a faithful sound, and when you dig in with more forceful delivery it responds very well. With acoustic guitar it's easy to capture a non-boomy sound, and once again the non-hyped sound is great. The smooth response also lends itself to complex sounds such as guitar amp, strings and percussion. So, any gripes? We did crank our mic pre up to max and understandably the valve hiss was noticeable. In fact, the noise spec is slightly better than many of the classic valve mics, but we'd look for something else first for quiet sources. With the Aria, Sontronics has set aside the creative visuals and gone for a classic look with a tried and test clip design. It's often focused on delivering a smooth non-hyped sound. 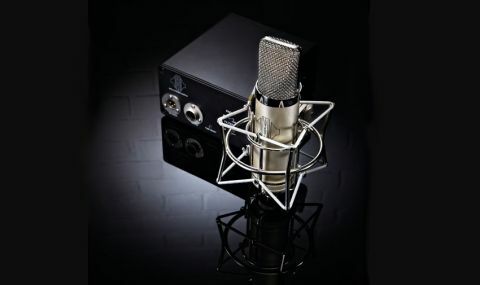 It's a winning combination and although not cheap is more affordable than the Austrian and German mics it takes some of its inspiration from.